We work on contracts from £250,000 to £3 million and welcome enquiries about projects in any sector. 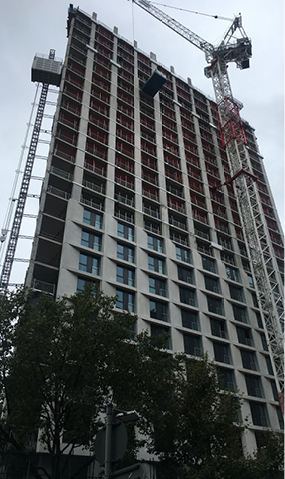 We’ve delivered vital infrastructure that’s dependable, efficient and safe, in buildings as diverse as Elephant Road mixed housing in London SE1, the Clarges Mayfair Estate ‘super-prime’ residential building, Whittington Hospital NHS UK, Government buildings and in biomedical facilities. Even as we’ve grown, we’ve maintained the highest levels of customer service and quality, exceeding industry standards and finding innovative ways to maximise customer satisfaction. Our community and environment programmes are far more than nice add-ons. We invest in them because they are fundamental to building strong relationships with our clients, employees, and communities where we work. They help us fulfil our promise of considerate construction, build our positive reputation, and deliver on our commitments aligned with the United Nations Sustainable Development Goals. We’re absolutely committed to the part we can play building a better world for generations to come and have aligned our commitments to the UN Global Sustainability Goals. Charmain established her business expertise through a 25-year career in banking and finance. She held several roles at Barclays Bank during her sixteen years with the company, including positions in corporate banking, wealth and investments, and marketing. With qualifications from the Chartered Banker Institute, Charmain progressed to self-employment, working as an independent banker incorporating property investments. At Redmond, Charmain runs key initiatives to support the vision of the business and leads on recruitment strategies. Mick joined Redmond in 2017 following a 30-year career in the retail sector where he held several management roles, culminating in a position involving the performance management of over 400 people. His focus is building high performance teams through effective people development, the initiation and promotion of a safety and compliance culture, and stakeholder engagement to drive continuous improvement. His management training and retail experience is bringing fresh insights to Redmond’s customer-centric approach. Phil has worked in the plumbing and heating industry for nearly 30 years, beginning his career with a four-year City & Guilds apprenticeship and quickly progressing to foreman and supervisor roles, and on to site manager and project manager. He has also held the position of contracts manager, run his own business and been a director at several companies. His experience spans domestic and commercial projects, including major scale residential developments, medical facilities, and airports. Marc Tulloch MRICS, BSc (Hons) is a highly experienced commercial director and claims consultant. He joined Redmond Group in 2018 following 17+ years working with major contractors. He has managed large teams of quantity surveyors and worked on numerous projects simultaneously whilst maintaining hands-on involvement. Marc is also experienced in settling difficult final accounts through negotiation and dispute resolution processes. He is a Member of the Royal Institution of Chartered Surveyors. Paul is a non-executive director and independent advisor to business and government, specialising in the sustainable built environment. Prior roles include Director of Environment and Sustainability at both Balfour Beatty and WSP, as well as Head of Sustainability at Bovis Lendlease. His roles today include London Sustainable Development Commissioner, as appointed by the Mayor of London in 2010; membership of the Green Construction Board’s Infrastructure Working Group; Chair of Constructing Excellence’s Sustainability Group; and a Fellow of IEMA. Paul has a PhD from Imperial College and regularly chairs and facilitates construction sector conferences. He is supporting Redmond on the delivery of company strategy, helping to grow the business in a sustainable manner. We’ve built our reputation providing best-in-class service across the following five sectors. We’ve completed works for major office developments and an increasingly wider range of real estate, including integrated developments where commercial, residential, retail and leisure facilities are combined. We expect integrated developments to be a growth area as new forms of urban living evolve. We work in greenfield and brownfield sites, working in close collaboration with the main contractor to meet the schedule commitments without any compromise on quality and safety. We are experienced at helping our clients meet international environmental and sustainability standards for commercial properties, including BREEAM, LEED and SKA. We install pipework and controls that improve water and energy efficiency. The UK government has set an ambitious target to deliver 1 million new homes by 2020 and this is driving high levels of activity in the residential sector. With our extensive experience in all forms of housing we have the skills to support contractors working to meet this demand. We work on new builds and re-fits, supporting private companies, housing associations and local councils. Our work in the government sector covers varied real estate, often requiring high level security checks. Works involving public money also require detailed specifications on quality, timescales and budget which we are adept at delivering to due to the high standards we set for all our contracts. Works are frequently upgrades to existing buildings where infrastructure needs to be adapted to modern-day needs. This can involve buildings of historical interest where extra care and consideration is required to protect the integrity of the environment. We have contributed to several medical refurbishment projects, working in close partnership with the architects and lead contractor to deliver the infrastructure required to meet specific medical needs and deliver to public health standards. Managing logistics is a key part of medical contracts. We carefully fit our works around the activity of a live hospital and ensure public health and safety at all times. With the rise of the biotech sector in the UK, biomedical facilities are becoming a specialty of our business. These facilities include complex pipework to support the range of heat and water requirements, including chilled water, low temperature hot water, and gas and water supplies to research facilities. Our highly trained staff are skilled at following detailed designs provided by the client’s design team, refining pipework to the exact parameters of the construction site, and collaborating with manufacturers throughout to ensure every fitting is installed correctly and meets our own quality standards. All proceeds from our scrap metal are donated to charity or our mobile community zoo. We’re actively developing initiatives that will help recruit more women into our on-site workforce. We’ve engaged with the LGBT community to reinforce our commitment to diversity and inclusion within our team and industry.